Twists and handlebar mustaches command attention where ever they go. Always majestic and well kept, never scraggly. That's because those mustaches know that the Zeus Mustache Styling Wax, Mega Hold is the only way to go! Its water based formula applies clear and gives all day hold. When it's time to relax, it washes out easily without leaving waxy residue behind. Pair it with the Zeus Saw-Cut Mustache Comb to unlock the highest level of style. Saw-cut and hand polished, this comb packs a punch at its small size of 3" in length. Its teeth are curved to fit your upper lip for optimum mustache taming. Go show those other 'staches what style is. 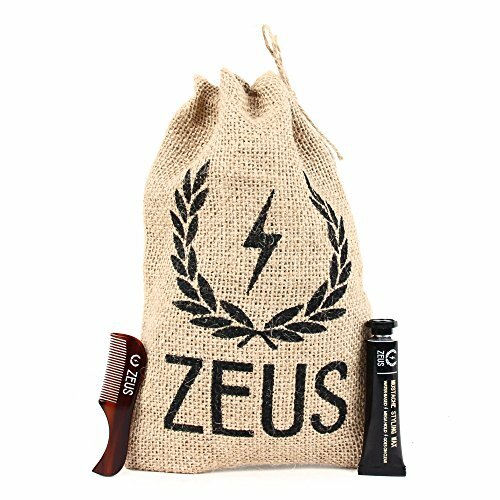 MUSTACHE SET: Includes Zeus Mustache Styling Wax, Mega Hold + Zeus Handmade Saw-Cut Mustache Comb! MEGA HOLD: Made to keep your mustache in place all day! WATER BASED: Goes on clear and rinses clean with no waxy residue left behind! HIGH QUALITY: These mustache combs are saw-cut and hand polished for a true quality feel. DIMENSIONS: Comb Size: 3" Length x 0.75" Width, Teeth are 3/8" Long. If you have any questions about this product by ZEUS, contact us by completing and submitting the form below. If you are looking for a specif part number, please include it with your message.